The SingaporeMotherhood Team, with little Elliott leading the way, headed to the official launch of SuperPark Singapore on 17 November 2018 to discover the ‘Superparking’ lifestyle from Finland. While trying painstakingly to crawl through child-size play equipment with his little girl, Finnish businessman Taneli Sutinen thought, “Why not create an activity park where children and adults can play side-by-side?” Thanks to one father’s eureka moment, the first SuperPark was born in Finland in 2012. 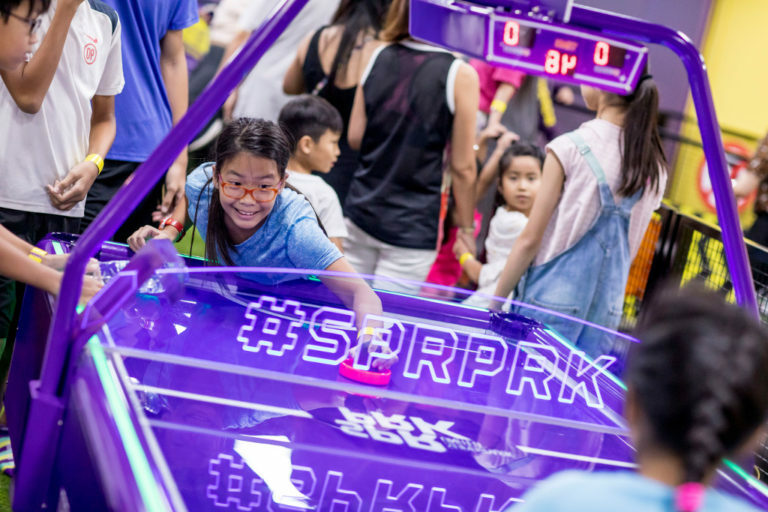 It was so successful that fast-forward to 2018, Singaporeans young and old can now experience the Superparking lifestyle for themselves! 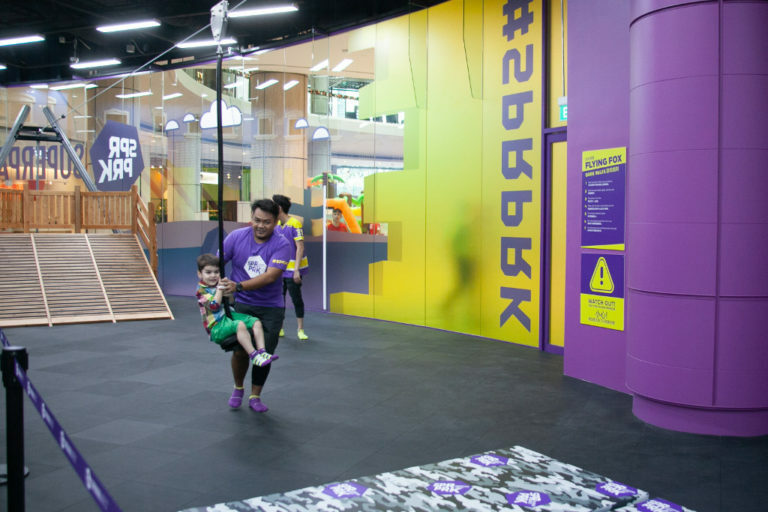 Spanning 40,000 sqf over two floors at Suntec City, SuperPark Singapore offers over 20 activities across three themed areas. 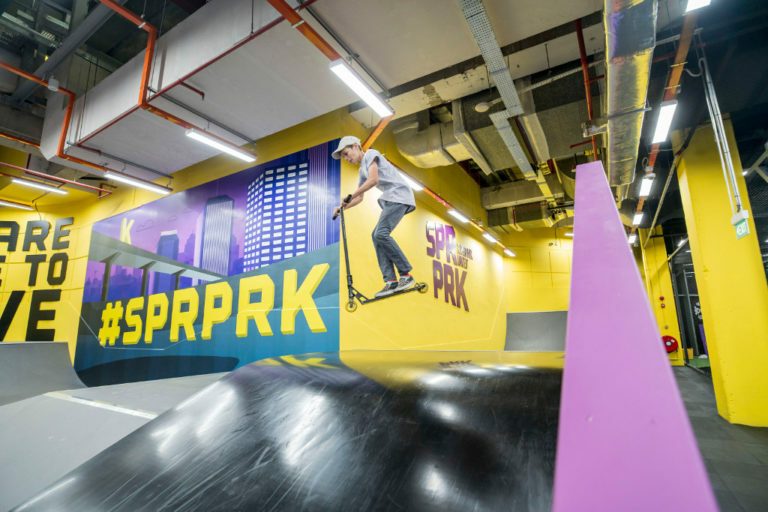 Three of the activities are brand new and SuperPark Singapore’s the first in the world to have them – yay, us! But more on that later. Upon registering at reception, we got our wristbands and collected our special SuperPark grip socks. We were then directed to rows of lockers and benches where we put on the socks and stowed our belongings. It’s all quite seamless, with electronic lockers and turnstiles unlocked via a chip in the wristbands. Suffice it to say that our intrepid little roving reporter, Elliott, was chomping at the bit to dive in. 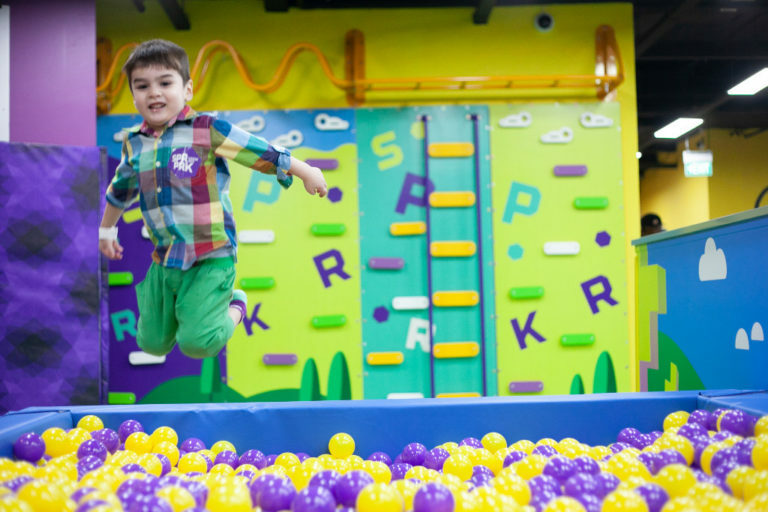 If your little adventurer is under 100cm in height, then you’ll have a hard time exploring beyond the Kids Gym. 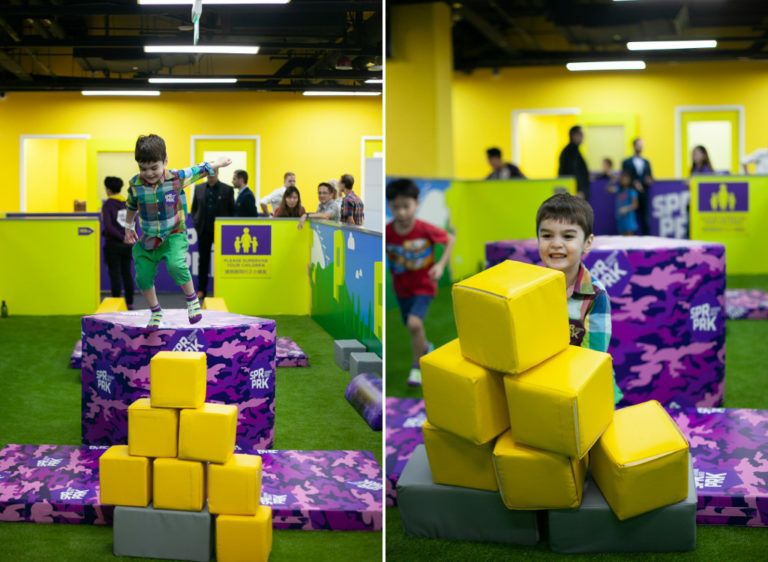 Part of the Adventure Area, it’s located closest to the entrance and is specially designed for toddlers and preschoolers. An accompanying adult should be present to supervise, and to prevent accidents, no older kids are allowed. There are also dedicated and friendly staff always on hand to engage and guide the little ones along. Elliott really enjoyed the mini obstacle course. 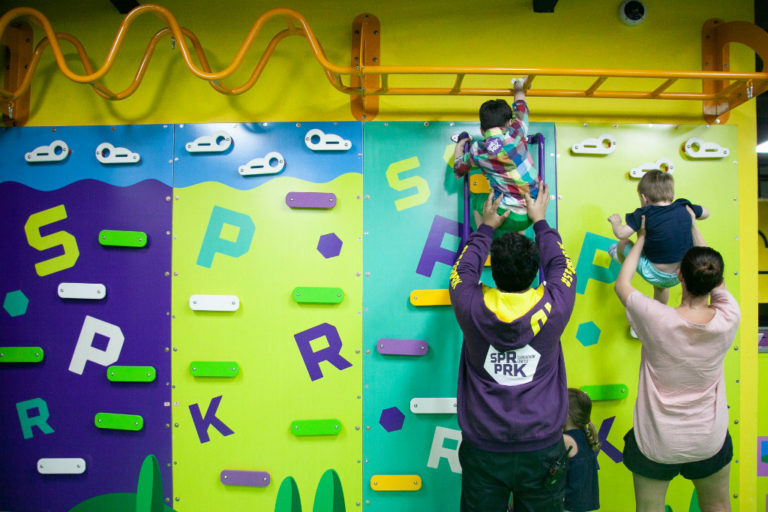 The Kids Gym has its own alphabet-themed climbing wall complete with monkey bars for your little monkeys. And of course, the ubiquitous ball pit, one of Elliott’s favourite things. 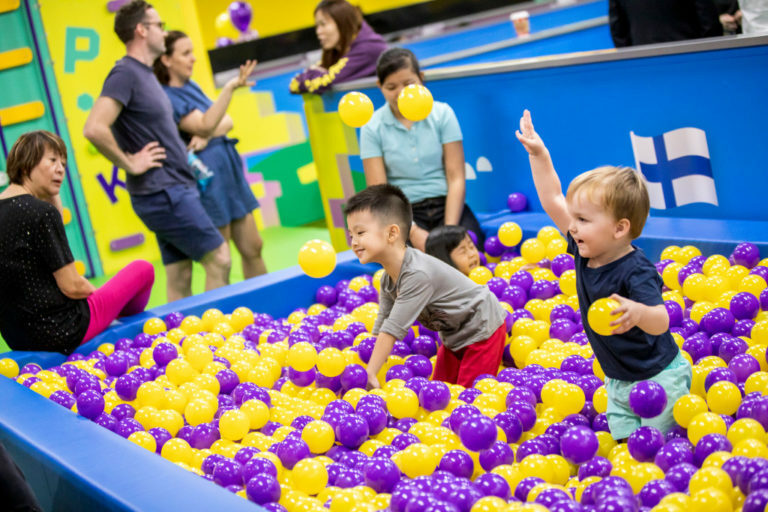 The one here is a wee bit deeper than the average indoor playground ball pit, which means Elliott had a well, ball! Unfortunately, Adventure City wasn’t ready yet during our visit. 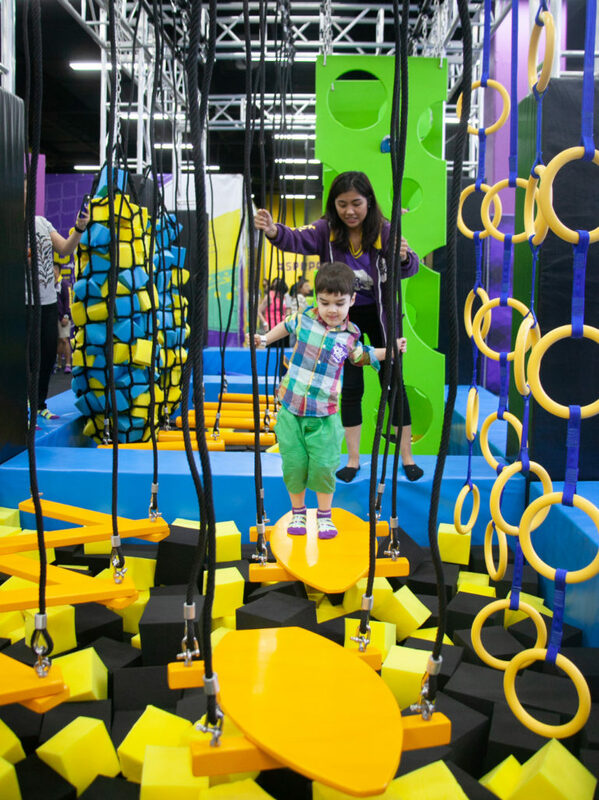 A multi-level maze of climbing equipment, towers and tunnels, it’s designed so that parents can join in too. We hear it boasts both physical and mental challenges, with digital features as well. Elliott will surely be back to check it out! 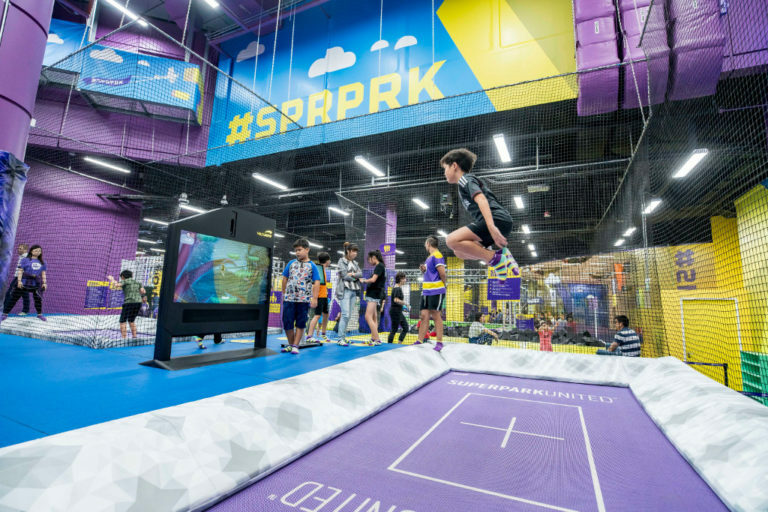 SuperPark believes that children are made to move with joy. At the same time, it wants everyone else to put down your smartphones, let loose and join in. This is why the Adventure Area is designed so that parents and older siblings can play alongside the little ones. 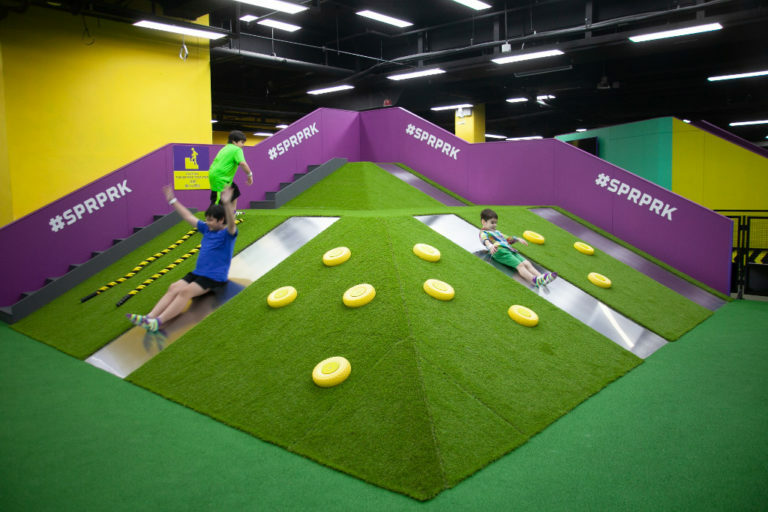 Once you’ve persuaded your tots to leave the Kids Gym, discover the Sliding Mountain (above), tube slides, trampolines, ziplines, a pedal car racing track and more. Ready to play? 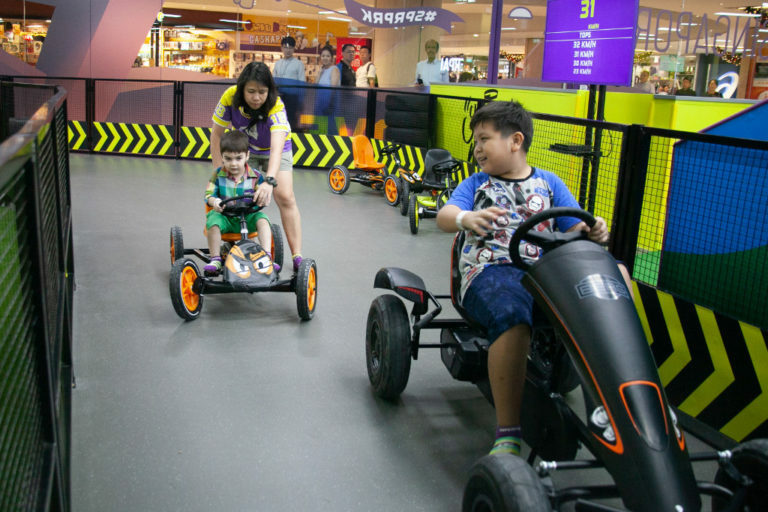 The Pedal Cars come in various sizes to suit the riders, and the track even takes you through a tunnel. Elliott hasn’t quite mastered cycling, so he needed extra help. He’ll definitely be back to conquer the track next time! The Flying Fox, of course, was a huge draw. Kids young and old were queuing up for their turn on the zipline. Kudos to the amazing staff who helped make sure the lighter ones like Elliott had fun. Over and over again! We lost count of how many times he went on it, and he even learnt to stand while zipping along. 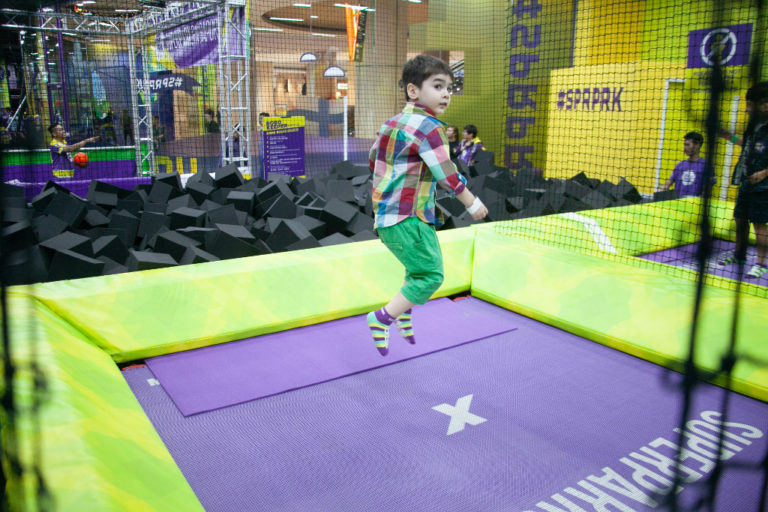 With a dedicated Kids Trampoline section, there’s no worry that the little ones will get bumped into or trampled on. In fact, there’s a rule that allows only one child within each netted trampoline at one time. (See also: Tayo Station at Downtown East: 10,000 sq ft of Fun + a Road Circuit too! 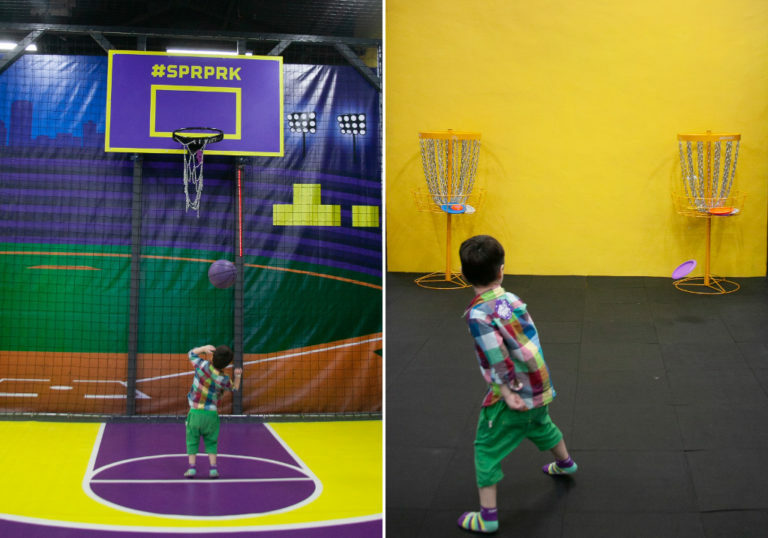 The second themed area in SuperPark Singapore is the Game Arena. It’s perfect for older kids with a competitive streak to get their game on. Challenge one another, make new friends, and have parent-child competitions for some family bonding fun. 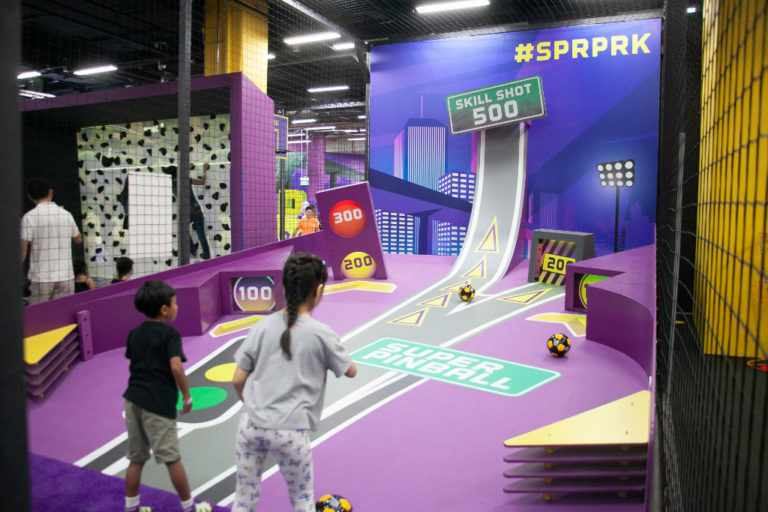 Try your hand at high-tech pinball, street basketball, bowling, baseball and more. Scores are decided by digital systems and radar, and you can even try to score against an AI goalkeeper! Trying to score against Robo Keeper isn’t as easy as it looks. 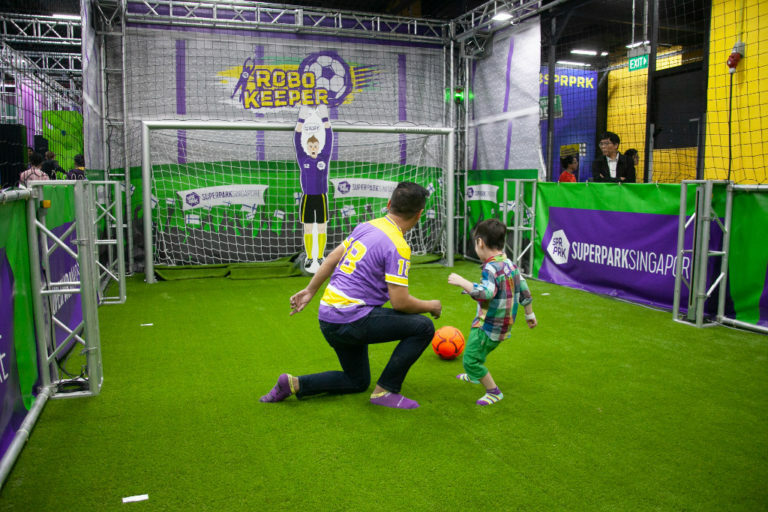 While it’s designed so that older kids and adults can take a shot at the AI goalkeeper − yes, Robo Keeper actually reacts to block you from scoring! − the staff let the little ones ‘cheat’ by getting closer to the goal. If you’ve ever played pinball, you have to try Super Pinball. Instead of controlling the flippers with your hands, you kick the balls to various markers to score points. It’s a surprisingly good workout! 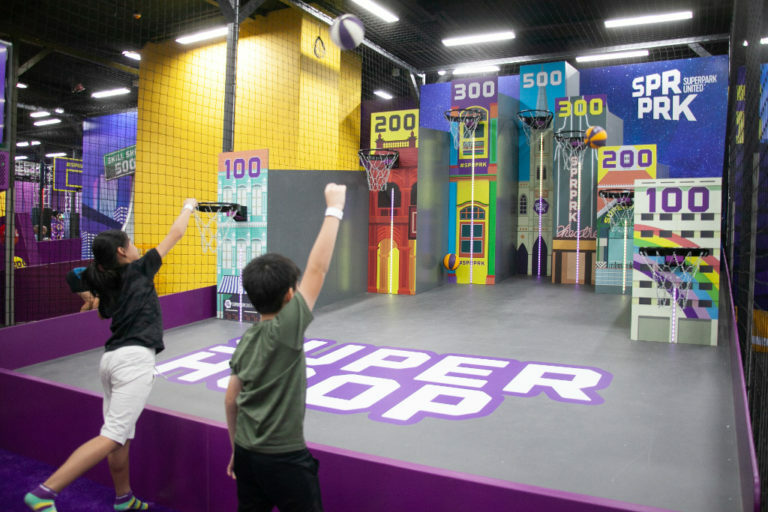 Right next door is Super Hoop, which tests your hand-eye coordination. Chalk up points on the electronic scoreboard with each ball you toss into the hoops. See who gets the high score! While Elliott is still a little too young for activities such as Street Basketball, Street Soccer, Baseball and Superball (dodge ball with a twist), he was still game to try. He also had a few tosses of disc golf! Unlike regular bowling where you roll the ball down the lane to knock ten pins over, Super Bowling pits you against an incline. 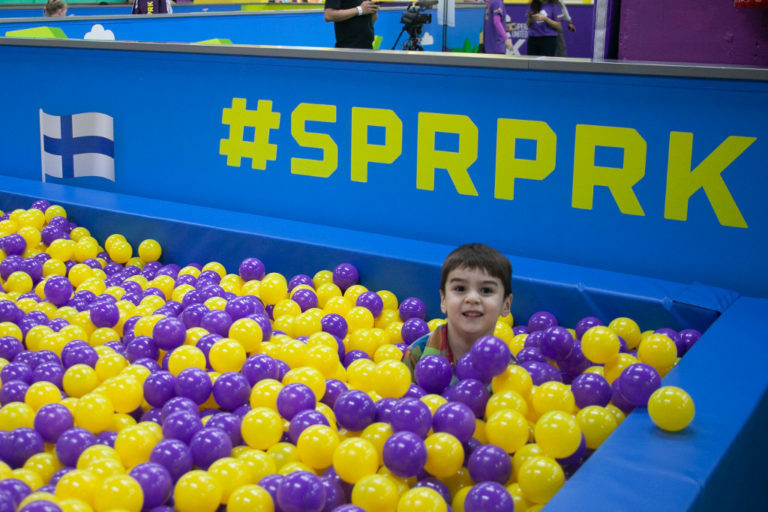 Of all the activities in the Game Arena, this was Elliott’s favourite, even though he couldn’t get the 1-kg ball far enough. Points for effort! 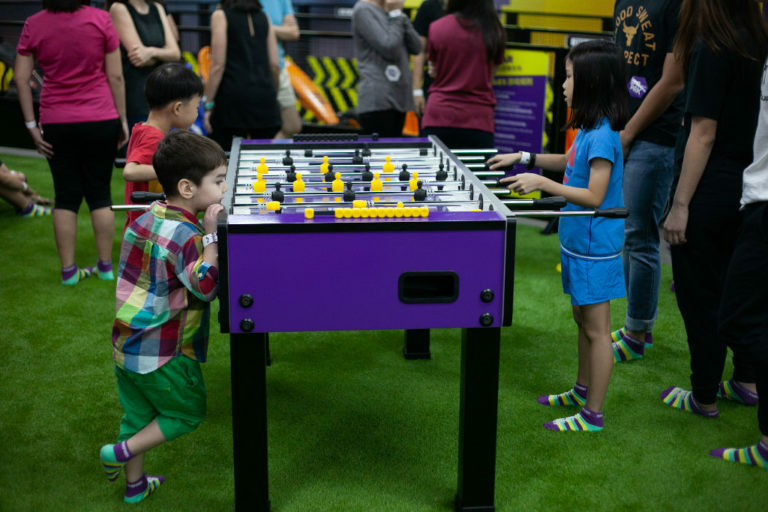 With most sports in the Game Arena given a digital upgrade, old-school table games including Foosball and Air Hockey weren’t left out either. 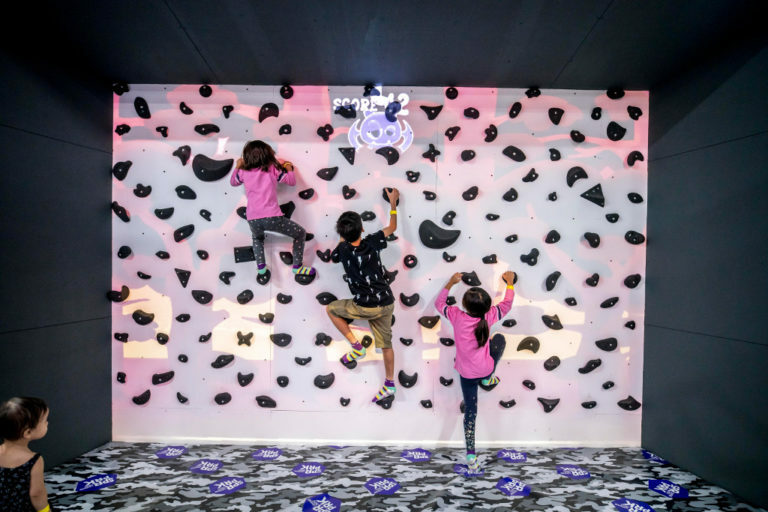 The Freestyle Hall is purpose-built for fans of the Ninja Warrior TV franchise, parkour exponents, gymnast-wannabes and indoor rock-climbing enthusiasts. The biggest draw is probably the indoor skate park, where you can practise skateboard and scooter tricks in air-conditioned comfort. It’s pretty obvious that teenagers are in their element here at the third themed area. Not to say that younger ones can’t try – with some help, of course. And adults can prove that they still have it too! 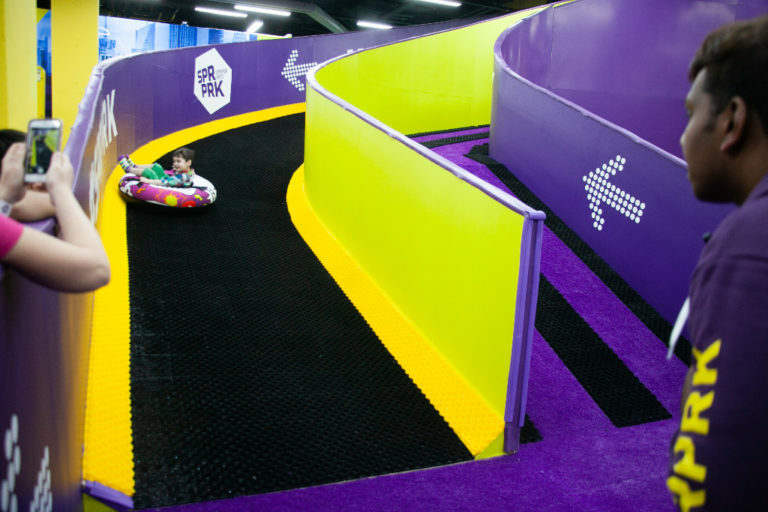 With all the requisite ramps and slopes, Skate and Scoot World is undoubtedly where adrenaline rushes abound. You can bring in your own gear and suitable footwear (this is the only area which allows shoes). Best of all, you can ‘rent’ − for free! − equipment such as scooters and helmets so you and your kids can safely learn together. 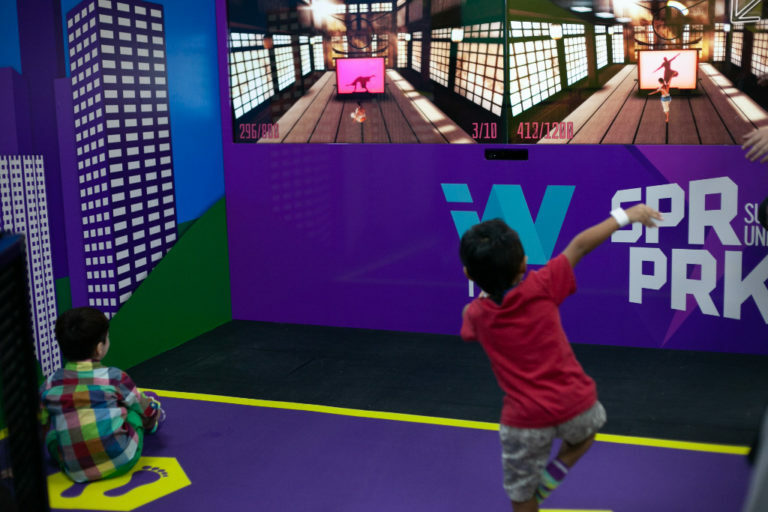 An interactive parkour game, i-Wall is one of the three exciting new game experiences debuting at SuperParks worldwide. Parkour around town or become the next karate kid. The digital screen registers your performance while you’re at it. The Augmented Climbing Wall may not look like much, but watch out when the games begin. The best way to beat this digital whack-a-mole game is to team up and cover as much wall as you can. 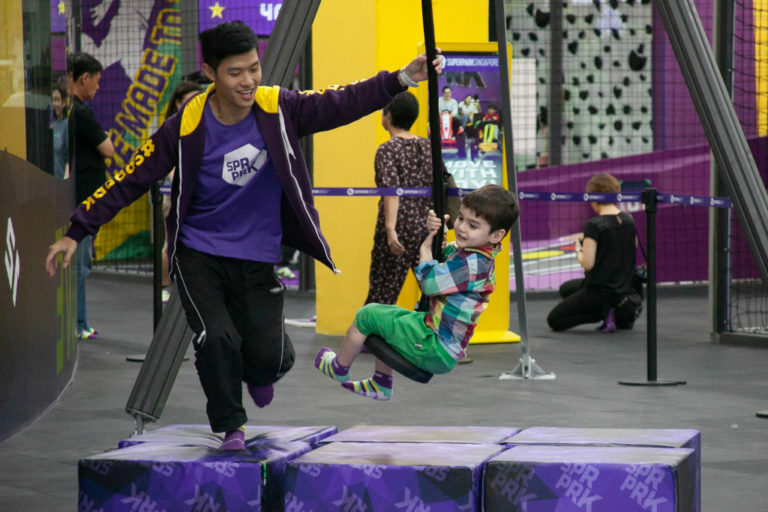 Fancy being the next ninja warrior? Then attack the Ninja Track circuit, another gripping new experience to join the Superparking lifestyle. 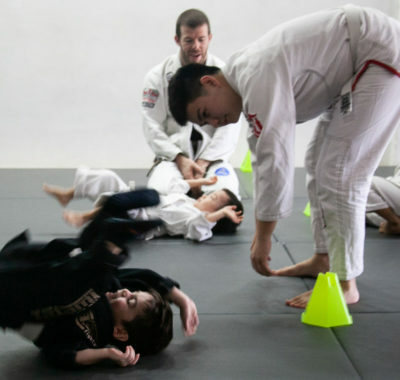 With obstacles of varying difficulty levels, even the littlest ones can try to level up. Elliott had fun attempting it but we discovered it’s actually harder than it looks! 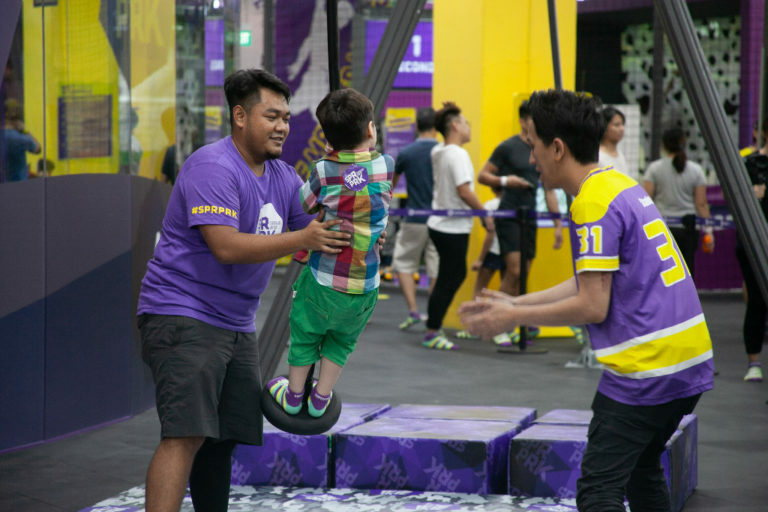 Other highlights in the Freestyle Hall that are more suited to teens and adults include the interactive Trampoline Platform, huge Foam Pit and the Clip and Climb, a futuristic climbing experience that’s the third of the three brand new additions introduced worldwide. Yep, right here at SuperPark Singapore. 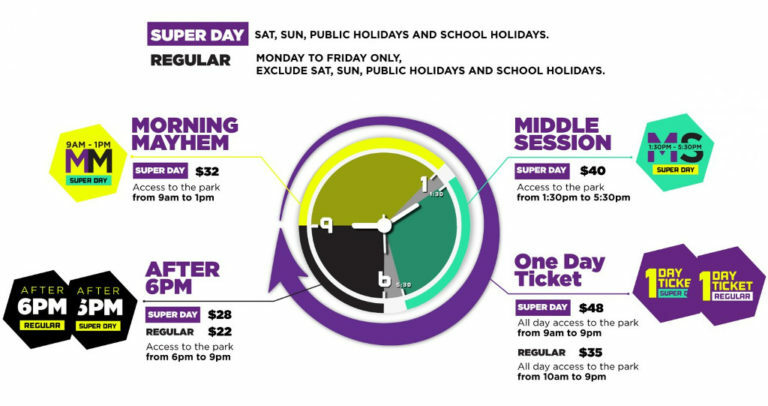 Admission is surprisingly affordable, although you have to purchase the mandatory SuperPark grip socks ($3 per pair) separately. Still, considering all the activities on offer and even equipment rental (lockers, scooters, helmets, etc) included in the ticket price, we feel it’s worth it. Also, we can’t rave enough about the staff, who go above and beyond guiding the kids through all the activities. Apparently, many of them are actually certified coaches! Addiction − We’ve heard of kids (and adults too!) constantly clamouring to return to SuperPark Singapore, Elliott included. Physical symptoms − Since our visit, Elliott has been climbing around the furniture at home, stuffing his toes into drawer grooves to scale closets, and jumping from sofa to coffee table, creating his own Ninja Track.